Hayley Atwell is set to star in a new 'Captain America' TV series. 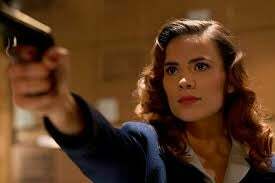 The 31-year-old actress - who recently wrapped on the second movie in the franchise, 'Captain America: The Winter Soldier', in which she plays Peggy Carter, the titular star's former love interest - will soon start work on 'Agent Carter', a small screen spin-off which will air in the US. A source told the Daily Mirror newspaper: ''This is a massive deal for both Hayley and Marvel comic fans. ''It's Marvel's major project of 2014, and it will be a big budget production. ''Hayley is absolutely thrilled to have the opportunity and is incredibly grateful to Marvel fans who have basically been campaigning for a spin-off show for the past six months. The brunette stunner has previously admitted she would be interested in starring in a spin-off TV series because she wants to show a different side to no-nonsense Peggy. ''I think Marvel probably take that very seriously, and it's certainly something I would be a part of doing. I'd be interested to show different sides of Peggy.